© 2015 Maria Balsamo, Jean-Loup d`Hondt, Jacek Kisielewski, M. Antonio Todaro, Paolo Tongiorgi, Loretta Guidi, Paolo Grilli, Yde de Jong. Fauna Europaea provides a public web-service with an index of scientific names (including important synonyms) of all living European land and freshwater animals, their geographical distribution at country level (up to the Urals, excluding the Caucasus region), and some additional information. The Fauna Europaea project covers about 230,000 taxonomic names, including 130,000 accepted species and 14,000 accepted subspecies, which is much more than the originally projected number of 100,000 species. This represents a huge effort by more than 400 contributing specialists throughout Europe and is a unique (standard) reference suitable for many users in science, government, industry, nature conservation and education. Gastrotricha are a meiobenthic phylum composed of 813 species known so far (2 orders, 17 families) of free-living microinvertebrates commonly present and actively moving on and into sediments of aquatic ecosystems, 339 of which live in fresh and brackish waters. The Fauna Europaea database includes 214 species of Chaetonotida (4 families) plus a single species of Macrodasyida incertae sedis. This paper deals with the 224 European freshwater species known so far, 9 of which, all of Chaetonotida, have been described subsequently and will be included in the next database version. Basic information on their biology and ecology are summarized, and a list of selected, main references is given. As a general conclusion the gastrotrich fauna from Europe is the best known compared with that of other continents, but shows some important gaps of knowledge in Eastern and Southern regions. The European Commission published the European Community Biodiversity Strategy, providing a framework for development of Community policies and instruments in order to comply with the Convention on Biological Diversity. This Strategy recognises the current incomplete state of knowledge at all levels concerning biodiversity, which is a constraint on the successful implementation of the Convention. Fauna Europaea contributes to this Strategy by supporting one of the main themes: to identify and catalogue the components of European biodiversity into a database in order to serve as a basic tool for science and conservation policies. With regard to biodiversity in Europe, both science and policies depend on a knowledge of its components. The assessment of biodiversity, monitoring changes, sustainable exploitation of biodiversity, and much legislative work depend upon a validated overview of taxonomic biodiversity. Towards this end Fauna Europaea plays a major role, providing a web-based information infrastructure with an index of scientific names (including important synonyms) of all living European land and freshwater animals, their geographical distribution at country level and some additional useful information. In this sense, the Fauna Europaea database provides a unique reference for many user-groups such as scientists, governments, industries, conservation communities and educational programs. Fauna Europaea started in 2000 as an EC-FP5 four-years project, delivering its first release in 2004 (Jong et al. 2014). After thirteen years of steady progress, in order to efficiently disseminate the Fauna Europaea results and to increase the acknowledgement of the Fauna Europaea contributors, novel e-Publishing tools have been applied to prepare data-papers of all major taxonomic groups. For this purpose a special Biodiversity Data Journal Series has been compiled, called Contributions on Fauna Europaea. This work was initiated during the ViBRANT project and is further supported by the recently started EU BON project. This paper holds the first publication of the Fauna Europaea Gastrotricha data sector as a BDJ data paper. Within the EU BON project also further steps will be made to implement Fauna Europaea as a basic tool and standard reference for biodiversity research and to evaluate taxonomic expertise capacity in Europe. The Fauna Europaea data-papers will contribute to a quality assessement on biodiversity data by providing estimates on gaps in taxonomic information and knowledge. The Fauna Europaea is a database of the scientific names and distribution of all living, currently known European land and fresh-water animal species assembled by a large network of experts, using advanced electronic tools for data collations and validation routines. An extended description of the Fauna Europaea project can be found in Jong et al. 2014). A summary is given in the sections below. The Gastrotricha are one of the 58 Fauna Europaea major taxonomic groups, and currently number 326 freshwater species worldwide, 224 of which reported from Europe. The data were acquired and checked by 5 specialists. No division of the taxa groups to be checked has been set among the specialists, thus all the specialists have to be considered responsible for the available data (Fig. 1​, Table 1). Responsible specialists per family in Gastrotricha. The actual number of databased species, the total number of known/described species (showing a potential information gap) plus an estimate of the total number of existing species (described plus undescribed) (showing a potential knowledge gap) for Europe are given per family (see also Fig. 1). FaEu data set Gastrotricha species per family: the updated number of species is reported in brackets. See Table 1​ for family statistics. 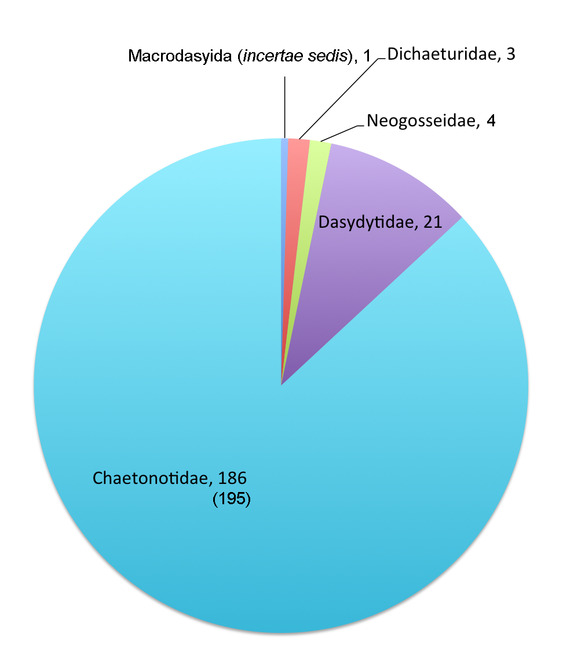 The phylum Gastrotricha currently (May 2015) counts 813 species of free-living, microinvertebrates commonly present and actively moving on and into the sediments of aquatic ecosystems where they represent a significant component of meiofauna, with densities up to 364 ind/cm2 in marine sands and 168 ind/cm2 in freshwater sediments (Nesteruk 1993, Nesteruk 1996, Todaro and Hummon 2008). Gastrotricha have ‘Aschelminthes’ or ‘pseudocoelomates’ features such as a worm-like body, a complete intestine, and a primary body cavity even if almost vestigial (Hyman 1951). Morphological and ultrastructural studies support a sister-group relationship of Gastrotricha with Cycloneuralia or with Ecdysozoa, whereas molecular analyses mainly carried out on the gene 18S rDNA have suggest to include the phylum into the Platyzoa, close to Gnathostomulida and acoelomate forms (for an overview of the major phylogenetic scenarios concerning Gastrotricha among the Bilateria as well as the internal relationships of the phylum, see Balsamo et al. 2010 and Kieneke and Schmidt-Rhaesa 2015). Recent studies based on a trascriptomic-phylogenomic approach found the gastrotrichs to be the sister taxon of the Platyhelminthes (e.g. Egger et al. 2015). Classical morphological taxonomy recognizes two orders, Macrodasyida and Chaetonotida, quite different in general morphology, biology and ecology (Balsamo and Todaro 2002, Balsamo et al. 2014, Kieneke and Schmidt-Rhaesa 2015). The order Macrodasyida includes 356 species (10 families, 35 genera), all interstitial, marine or brackish-water except for only 2 freshwater species. The marine monotypic genus Hemidasys has been considered extinct by Hummon and Todaro (2010). The vast majority of Chaetonotida, 335 species, colonize fresh waters, with a clear preference for eutrophic habitats, where most species known so far live as epiphytic or periphytic. Only about 70 freshwater species have been found in psammic habitats, and less than 35 species are known from sediments of running waters. Two entire families (Dasydytidae and Neogosseidae), with about 50 species, are semipelagic or fully planktonic: the colonization of water column corresponds to specific, characteristic morphological adaptations (Kisielewski 1981, Kisielewski 1990, Schwank 1990, Ricci and Balsamo 2000, Balsamo et al. 2008, Todaro et al. 2013, Kånneby and Todaro 2015). Gastrotrichs share several morphological and physiological features with other groups of freshwater microinvertebrates: among them are small size, soft body, worm-like body shape, high contractility, adhesive glands, ciliary locomotion, triradiate pharynx with well-developed musculature, short life cycle, common parthenogenic reproduction, production of resting stages (d’Hondt 1971). But the adaptive potential of freshwater Gastrotricha is relatively limited compared to other animal phyla like Rotifera or Nematoda, so that their distribution appears to be narrower and to current knowledge it does not extend to extreme habitats. The diversity of the phylum Gastrotricha is not very high, but these animals, as a part of the microphagous benthic community, play a significant ecological role in aquatic environments, linking the microbial loop to the higher trophic levels (Balsamo et al. 2014). The order Macrodasyida includes only 2 freshwater species: Redudasys fornerise, belonging to the family Redudasyidae (which also comprises a marine species, see Todaro et al. 2012), and Marinellina flagellata, which was previously assigned either to Macrodasyida (Ruttner-Kolisko 1955, Kisielewski 1987) or to Chaetonotida, in the freshwater family Dichaeturidae (Remane 1961) and is now considered a Macrodasyida incertae sedis. It is the only Macrodasyida species known from Europe, where it was found only once in Austria (Ruttner-Kolisko 1955). The order Chaetonotida encompasses 335 freshwater species and 4 strictly brackish-water species. Four families (12 genera) are exclusively freshwater (Dasydytidae, Neogosseidae, Proichthydiidae, Dichaeturidae), and the largest family, Chaetonotidae, includes both marine and freshwater species (2 genera exclusively marine, 5 freshwater and 5 including marine, brackish-water and freshwater species). Thanks to recent studies, the current systematics is relatively stable for the order Macrodasyida (Todaro et al. 2006, Hummon and Todaro 2010, Todaro et al. 2011, Todaro et al. 2012, Guidi et al. 2014, Todaro et al. 2014), except for the monotypic genus Marinellina (still incertae sedis). By contrast, the taxonomy of the order Chaetonotida has been repeatedly revised in the last decades and is still unstable especially at the species level (Schwank 1990, Kisielewski 1991, Kisielewski 1997, Kisielewski 1998, Leasi and Todaro 2008, Balsamo et al. 2009, Hummon and Todaro 2010, Balsamo et al. 2014). Furthermore, a phylogenetic study based on molecular markers found the largest chaetonotidan family, Chaetonotidae, and most of the genera included in it to be non-monophyletic (Kånneby et al. 2013). Actually, the taxonomy of the phylum has been founded on morphological traits both of the external structure and the internal anatomy, like the shape and size of the cuticular elements, the organization of the reproductive system and the fine structure of spermatozoa (Marotta et al. 2005, Hummon and Todaro 2010, Guidi et al. 2014). However, especially in Chaetonotida, several of these taxonomical characters appear to vary, even considerably, at species level and in some cases also at genus level, which makes taxonomic identification quite problematic (Schwank 1990, Balsamo et al. 2009). It must be said that Gastrotricha, small and diaphanous, should be observed alive with a very good microscopical equipment in order to recognize and measure all the morphological details taxonomically important (Balsamo et al. 2014). That is not always possible, considering the technical problems of collecting samples, maintaining them in the lab, searching for in them in the sediments under a stereomicroscope, and then isolating single specimens be anesthetized in some manner and to allow proper observation. However, several freshwater species can be suitably fixed and observed later with good results (Giere 2009). The recent introduction of molecular analyses to Gastrotricha has opened new perspectives in the study of phylogenetical relationships; an integrative taxonomical approach using both morphological and molecular methods seems essential to effectively revise the current classification according to phylogenetic relationships (Kånneby et al. 2012, Paps and Riutort 2012, Todaro et al. 2012, Kånneby et al. 2013, Todaro et al. 2014). We may expect a future increase in species numbers of Chaetonotidae and possibly of Dasydytidae. A reliable assessment of the estimated species number cannot be advanced due to the sporadic nature of faunistic findings and samplings, but a reasonable minimal estimate of possible increase in number of species known is advanced based on the current knowledge of unpublished data (Table 1). The Fauna Europaea database (version 2.4, January 2011) includes 215 species, 214 of which belong to the order Chaetonotida (4 families) and a single species incertae sedis is a member of the order Macrodasyida. Eight additional species of Chaetonotida have been described and another one has been recorded first for Europe after the release of the database, so that currently European freshwater species of Gastrotricha known so far add up to 224 overall (223 Chaetonotida + 1 Macrodasyida), that are considered in the present paper. A synthesis of European taxa is presented below. Common and rare representatives of European freshwater gastrotrichs. A-F, Fam. Chaetonotidae. A, Chaetonotus (Captochaetus) robustus (insert shows the peculiar scales); B, Chaetonotus (Chaetonotus) polyspinosus; C, Chaetonotus (Lepidochaetus) zelinkai; D, Ichthydium skandicum (insert shows the scales of the furcal base); E, Lepidodermella squamata (insert shows the dorsal scales); F, Polymerurus nodicaudus; G, Fam. Neogosseidae, Neogossea antennigera; H, Fam. Dasydytidae, Stylochaeta fusiformis. Scale bars: A, F =100 µm; B-E, G, H = 50 µm. Original images can be found here: Suppl. materials 2, 3, 4, 5, 6, 7, 8, 9. Tenpin-like body, 84-770 μm in length.Two adhesive tubes forming the caudal ‘furca’. Four cephalic ciliary tufts. Cuticle generally provided with ornamentations of various shape and size, in some cases smooth. Two longitudinal ventral ciliary locomotory bands. Pharynx generally cylindrical, slightly widened posteriorly. Parthenogenic; rudimentary testes or aberrant spermatozoa recorded in several species. This family is the largest one of the order, and includes most of the epibenthic and periphytic species colonizing standing waters as well as the few interstitial species known from psammic habitats. At global scale the family Chaetonotidae includes 277 freshwater species (10 genera). In European fresh waters the family is currently represented by 195 species in 8 genera: 5 genera include also marine species Aspidiophorus (15 species), Chaetonotus (125), Heterolepidoderma (18), Ichthydium (19), Lepidodermella (7), whereas 3 genera are exclusively freshwater: Fluxiderma (3), Polymerurus (7), Rhomballichthys (1). These numbers include 8 new species and a single new record for Europe that have been reported after the release of the Fauna Europaea database in January 2011. Tenpin-like or bottle-shaped body, 75-291 μm in length (caudal spines excluded). Caudal furca absent: rounded or truncated caudal end with 2 lobes bearing bristles or 2 to few long spines. Two cephalic ciliary tufts and a transversal band extending from ventral to dorsal side. Cuticle smooth, rarely with few faint scales. Ventrolateral spines short to very long, simple or more often barbed, isolated or in groups, inserted on the trunk region and sometimes movable. Few oblique ciliary locomotory series or tufts, rarely 2 bands (Haltidytes). Pharynx cylindrical with1-2 bulbs. Parthenogenic; rudimentary testes or aberrant spermatozoa recorded in several species. All species of Dasydytidae are freshwater, semiplanktonic and planktonic in standing waters. At global scale the family Dasydytidae includes 42 species in 7 genera. In European fresh waters the family Dasydytidae is represented by 21 species (6 genera): Anacanthoderma (2), Chitonodytes (3), Dasydytes (3), Haltidytes (3), Setopus (6) and Stylochaeta (4). Cylindrical body, 98-150 μm in length. Two pairs of adhesive tubes forming the caudal furca. Cephalic ciliature uniform and continuous with 2 ventral ciliary locomotory bands. Cuticle smooth. A dorsal, transverse series of some thin, straight bristles or spines anterior to the furca. Pharynx cylindrical. Sexuality unknown. All species of family Dichaeturidae are freshwater, very rare, semiplanktonic in standing waters. At global scale the family Dichaeturidae includes 4 species of a single genus. 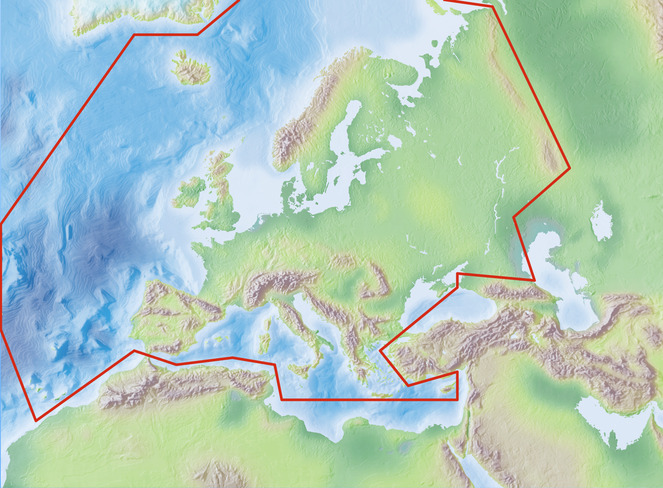 In European fresh waters the family Dichaeturidae is represented by 3 species in the single genus Dichaetura. Tenpin-like body, 90-310 μm in length (caudal spines excluded). Caudal furca absent: trunk end rounded or truncated with 2 short, caudal protuberances and 2 pairs or an unpaired median group of long simple or barbed spines. One dorsal and 2 ventral cephalic interrupted transverse ciliary bands. Cuticle smooth or with numerous fine spined scales. Several pairs of ventral ciliary locomotory tufts or oblique bands. Thick pharynx with 1-4 bulbs. Parthenogenic. All the species of family Neogosseidae are freshwater, semiplanktonic or planktonic in standing waters. At global scale the family Neogosseidae is composed of 9 species in 2 genera. In European fresh waters the family is represented by 4 species in 2 genera: Neogossea (3) and Kijanebalola (1 species, finding doubtful). Family Proichthydiidae, the only other family of Chaetonotida exclusively freshwater, includes 2 species of 2 monotypic genera (Proichthydium, Proichthydioides): it is known from Brazil and Japan but has not yet been reported from Europe. Cylindrical body, 220 μm in length. Two pairs of adhesive tubes forming the caudal furca. Two cephalic ventrolateral adhesive tubes. Numerous long sensory bristles on the head and along the body. Cuticle smooth. Ventral locomotory ciliature undescribed. Thick, cylindrical pharynx. Sexuality unknown. This single species of the genus was found only once from Austrian interstitial fresh waters. This BDJ data paper includes the taxonomic indexing efforts in the Fauna Europaea on European Gastrotricha covering the first two versions of Fauna Europaea worked on between 2000 and 2013 (up to version 2.6). The taxonomic framework of Fauna Europaea includes partner institutes, providing taxonomic expertise and information, and expert networks taking care about data collation. Every taxonomic group is covered by at least one Group Coordinator responsible for the supervision and integrated input of taxonomic and distributional data of a particular group. The Fauna Europaea checklist would not have reached its current level of completion without the input from several groups of specialists. The formal responsibility of collating and delivering the data of relevant families rested with a number of Taxonomic Specialists (see Table 1). For Gastrotricha the responsible Group Coordinator and Taxonomic specialist is Maria Balsamo, who is also Taxonomic Specialist, together with the other Associated Specialists listed in Table 2. A more detail overview of the Fauna Europaea classification and expertise network for Gastrotricha can be found here: http://www.faunaeur.org/experts.php?id=21. Responsible associated specialists in Gastrotricha. Data management tasks are taken care about by the Fauna Europaea project bureau. During the project phase (until 2004) a network of principal partners took responsability for various management tasks: Zoological Museum Amsterdam (general management & system development), Zoological Museum of Copenhagen (data collation), National Museum of Natural History in Paris (data validation) and Museum and Institute of Zoology in Warsaw (NAS extension). After the formal project ending (2004 till 2014) all tasks have been undertaken by the Zoological Museum Amsterdam. Since 2013 the data servers are hosted at the Museum für Naturkunde in Berlin (migrated from ZMA-UvA). On the available expert capacity, presently, in Europe faunistic, systematic and taxonomical studies on freshwater Gastrotricha species are actively carried out in Italy (University of Urbino), in France (MNHN) and in Sweden (NRM) by around five specialists. Some additional ultrastructural and phylogenetical work is done on Gastrotricha in Germany (Senckenberg & University of Hamburg). Outside Europe around six more specialists contribute to the taxonomy of (marine and freshwater) Gastrotricha. The area study covers the European mainland (Western Palearctic), including the Macaronesian islands, excluding the Caucasus, Turkey, Arabian Peninsula and Northern Africa (see: Geographic coverage). Standards. Group coordinators and taxonomic specialists have to deliver the (sub)species names according to strict standards. The names provided by Fauna Europaea are scientific names. The taxonomic scope includes issues like, (1) the definition of criteria used to identify the accepted species-group taxa, (2) the hierarchy (classification scheme) for the accommodation of the all accepted species and (3), relevant synonyms, and (4) the correct nomenclature. The Fauna Europaea 'Guidelines for Group Coordinators and Taxonomic Specialists', include the standards, protocols, scope, and limits that provide the instructions for all more than 400 specialists contributing to the project, strictly following the provisions of the current edition of the International Code of Zoological Nomenclature. Data management. The data records could either be entered offline into a preformatted MS-Excel worksheet or directly into the Fauna Europaea transaction database using an online browser interface (Fig. 3). Data set. The Fauna Europaea basic data set consists of: accepted (sub)species names (including authorship), synonym names (including authorship), a taxonomic hierarchy/classification, misapplied names (including misspellings and alternative taxonomic views), homonym annotations, expert details, European distribution (at country level), Global distribution (only for European species), taxonomic reference (optional), occurrence reference (optional). Fauna Europaea was funded by the European Commission under the Fifth Framework Programme and contributed to the Support for Research Infrastructures work programme with Thematic Priority Biodiversity (EVR1-1999-20001) for a period of four years (1 March 2000 - 1 March 2004), including a short 'NAS extension', allowing EU candidate accession countries to participate. Follow-up support was given by the EC-FP6 EDIT project (GCE 018340), by the EC-FP7 PESI project (RI-223806) and by the EC-FP7 ViBRANT project (RI-261532). Continuing management and hosting of the Fauna Europaea services was supported by the University of Amsterdam (Zoological Museum Amsterdam) and SARA/Vancis. Recently the hosting of Fauna Europaea was taken over by the Museum für Naturkunde in Berlin, supported by the EC-FP7 EU BON project (grant agreement №308454). For preparing the Gastrotricha data set additional support was received from MIUR (Italian Ministry of University and of Scientific and Technological Research). Fauna Europaea data have been assembled by principal taxonomic experts, based on their individual expertise, including literature sources, collection research, and field observations. In total no less than 476 experts contributed taxonomic and/or faunistic information for Fauna Europaea. The vast majority of the experts are from Europe (including EU non-member states). As a unique feature, Fauna Europaea funds were set aside for rewarding/compensating for the work of taxonomic specialists and group coordinators. 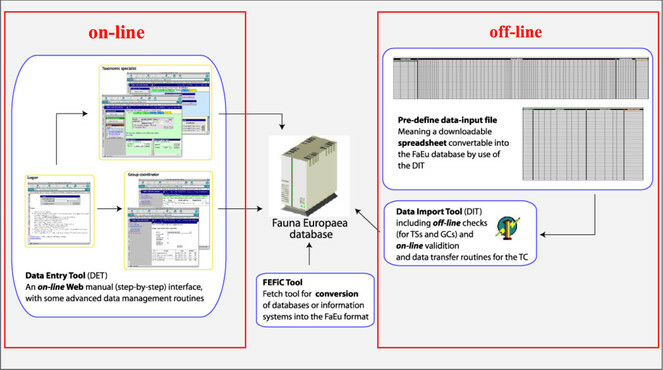 To facilitate data transfer and data import, sophisticated on-line (web interfaces) and off-line (spreadsheets) data-entry routines were built, integrated within an underlying central Fauna Europaea transaction database (see Fig. 3) This includes advanced batch data import routines and utilities to display and monitor the data processing within the system. In retrospect, it seems that the off-line submission of data was probably the best for bulk import during the project phase, while the on-line tool was preferred to enter modifications in later versions. This system works well, but will be replaced after 2013. A first release of the Fauna Europaea index via the web-portal has been presented at 27th of September 2004, the most recent release (version 2.6.2) was launched at 29 August 2013. An overview of Fauna Europaea releases can be found here: http://www.faunaeur.org/about_fauna_versions.php. Fauna Europaea data are unique in a sense that they are fully expert based. Selecting leading experts for all groups assured the systematic reliability and consistency of the Fauna Europaea data. Furthermore, all Fauna Europaea data sets are intensively reviewed at regional and thematic validation meetings, at review sessions on taxonomic symposia (for some groups), by Fauna Europaea Focal Points (during the FaEu-NAS and PESI projects) and by various end-users sending annotations using the web form at the web-portal. Additional validation on gaps and correct spelling was effected at the validation office in Paris. In general we expect to get taxonomic data for 99.3% of the known European fauna after the initial release. The faunistic coverage is not quite as good, but is nevertheless 90-95% of the total fauna. For Gastrotricha the current taxonomic coverage is about 96% (see Table 1), and the distribution of faunistic data by country is quite heterogeneous, according to the nationality of researchers. Checks on technical and logical correctness of the data have been implemented in the data entry tools, including around 50 "Taxonomic Integrity Rules". This validation tool proved to be of huge value for both the experts and project management, and contributed significantly to preparation of a remarkably clean and consistent data set. This thorough reviewing makes Fauna Europaea the most scrutinised data sets in its domain. The only other existing database specifically dedicated to freshwater species on a worldwide scale has been produced within FADA (Freshwater Animal Diversity Assessment Project), but it has not yet been published. A number of freshwater species appear also in the WoRMS (World Register of Marine Species) taxonomic database of Gastrotricha, since some species have been occasionally reported from brackish waters. By evaluating team structure and life cycle procedures (data-entry, validation, updating, etc. ), clear definitions of roles of users and user-groups, according to the taxonomic framework were established, including ownership and read and writes privileges, and their changes during the project life-cycle. In addition, guidelines on common data exchange formats and codes have been issued (see also the 'Guidelines for Experts' document). Species and subspecies distributions in Fauna Europaea are registered at least a country level, i.e. for political countries. For this purpose the FaEu geographical system basically follows the TDWG standards. The covered area includes the European mainland (Western Palearctic), plus the Macaronesian islands (excl. Cape Verde Islands), Cyprus, Franz Josef Land and Novaya Zemlya. Western Kazakhstan and the Caucasus are excluded (see Fig. 4). The focus is on species (or subspecies) of European animals of terrestrial and freshwater environments. Species in brackish waters, occupying the marine/freshwater or marine/terrestrial transition zones, are generally excluded. The four species of Chaetonotida only known from brackish waters have been included in the database, in which their particular habitat has been specified. This data paper covers the Gastrotricha content of Fauna Europaea, including 4 families, 214 species, 5 subspecies and 199 species synonyms of Chaetonotida and one species incertae sedis of Macrodasyida (Fig. 1, Table 1). Not all the species described to date are included in the current version of the Fauna Europaea database. The next version of the Fauna Europaea database will be updated with the most recent records. The placement of the genus Marinellina, the only one freshwater European Macrodasyida, is uncertain. In the database it was considered as a member of the family Turbanellidae in the order Macrodasyida Remane, 1925 (Rao and Clausen 1970), but since the taxonomic position of this genus is now actively debated, it is here reported as 'incertae sedis' according to the recent literature. Fauna Europaea data are licensed under CC BY SA version 4.0. The property rights of experts over their data is covered by their Fauna Europaea contract agreements. For more IPR details see: http://www.faunaeur.org/copyright.php. Global diversity of gastrotrichs (Gastrotricha) in fresh waters. Taxonomic and nomenclatural notes on freshwater Gastrotricha. Gastrotricha: Biology, ecology and systematics. Families Dasydytidae, Dichaeturidae, Neogosseidae, Proichthydiidae. The phylogenetic position and the intraphyletic relationships of Gastrotricha. A transcriptomic-phylogenomic analysis of the evolutionary relationships of flatworms. Meiobenthology. The microscopic fauna in aquatic sediments. Reproductive system and spermatozoa ultrastructure support the phylogenetic proximity of Megadasys and Crasiella (Gastrotricha, Macrodasyida). Gastrotricha. The Invertebrates Acanthocephala, Aschelminthes and Ectoprocta. A phylogenetic approach to species delimitation in freshwater Gastrotricha from Sweden. Phylogeny of Chaetonotidae and other Paucitubulatina (Gastrotricha: Chaetonotida) and the colonization of aquatic ecosystems. Gastrotricha from raised and transitional peat bogs in Poland. Two new interesting genera of Gastrotricha (Macrodasyida and Chaetonotida) from the Brazilian freshwater psammon. Origin and phylogenetic significance of freshwater psammic Gastrotricha. Inland water Gastrotricha from Brazil. The muscular system of Musellifer delamarei (Renaud-Mornant, 1968) and other chaetonotidans with implications for the phylogeny and systematization of the Paucitubulatina (Gastrotricha). Sperm ultrastructure of Macrodasys caudatus (Gastrotricha: Macrodasyida) and a sperm based phylogenetic analysis of Gastrotricha. Density and biomass of gastrotricha in sediments of different types of standing water. Molecular phylogeny of the phylum Gastrotricha: new data bring together molecules and morphology. Neodasys uchidai nov. spec., eine zweite Neodasys-Art (Gastrotricha Chaetonotoidea). The biology and ecology of lotic rotifers and gastrotrichs. Rheomorpha neiswestnovae und Marinellina flagellata, zwei Phylogenetisch interessante Würmtypen aus dem Süsswasserpsammon. 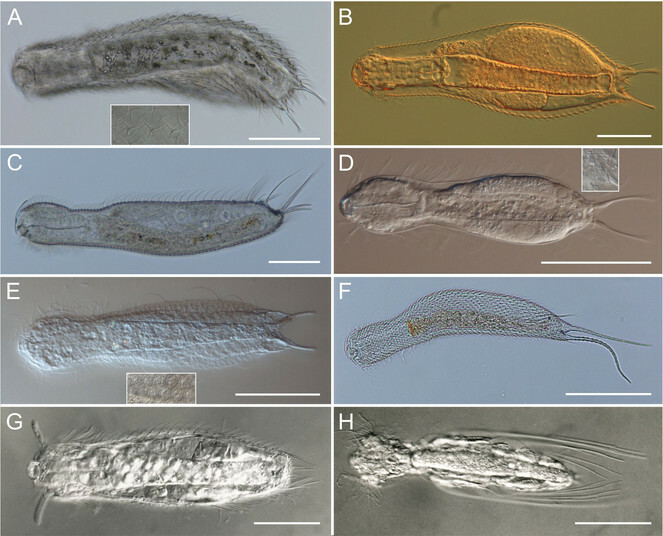 An overview and a dichotomous key to genera of the phylum Gastrotricha. A new species, genus and family of marine Gastrotricha from Jamaica, with a phylogenetic analysis of Macrodasyida based on molecular data. Neogosseidae (Gastrotricha, Chaetonotida) from the iSimangaliso Wetland Park, KwaZulu-Natal, South Africa. Morphology of Xenodasys (Gastrotricha): the first species from the Mediterranean Sea and the establishment of Chordodasiopsis gen. nov. and Xenodasyidae fam. nov.
Journal of the Marine Biological Association of the U.K.
Phylogeny of Thaumastodermatidae (Gastrotricha: Macrodasyida) inferred from nuclear and mitochondrial sequence data. Gastrotricha: a marine sister for a freshwater puzzle. Suppl. material 2: Figure 1A: Chaetonotus (Captochaetus) robustus (insert shows the peculiar scales); Scale bar =100 µm. Original image of Figure 1A. Suppl. material 3: Figure 1B: Fam. Chaetonotidae, Chaetonotus (Chaetonotus) polyspinosus; Scale bar =100 µm. Original image of Figure 1B. Suppl. material 4: Figure 1C: Fam. Chaetonotidae, Chaetonotus (Lepidochaetus) zelinkai; Scale bar =100 µm. Original image of Figure 1C. Suppl. material 5: Figure 1D: Fam. Chaetonotidae, Ichthydium skandicum (insert shows the scales of the furcal base); Scale bar =100 µm. Original image of Figure 1D. Suppl. material 6: Figure 1E: Fam. Chaetonotidae, Lepidodermella squamata (insert shows the dorsal scales); Scale bar =100 µm. Original image of Figure 1E. Suppl. material 7: Figure 1F: Fam. Chaetonotidae, Polymerurus nodicaudus; Scale bar =100 µm. Original image of Figure 1F. Suppl. material 8: Figure 1G: Fam. Neogosseidae, Neogossea antennigera; Scale bar = 50 µm. Original image of Figure 1G. Suppl. material 9: Figure 1H: Fam. Dasydytidae, Stylochaeta fusiformis; Scale bar = 50 µm. Detailed image of composted Figure 1.